One pursuit suspect was killed and a second critically injured when a high-speed chase with police ended in a fiery head-on crash in South Los Angeles on Wednesday night. 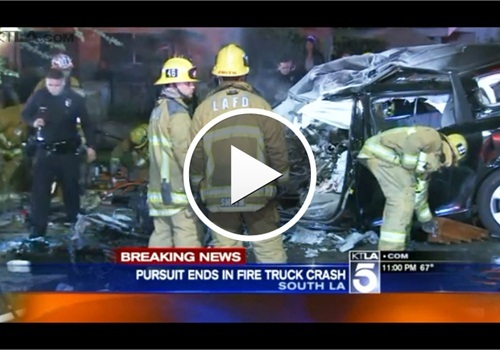 The collision occurred around 9:15 p.m. when the suspect’s van slammed into the front of a fire truck that was responding to an earlier medical call in the area, according to Brian Humphrey, spokesman for the Los Angeles Fire Department. Video from the scene showed one of the occupants being extricated from the charred van. He was transported in critical condition, Humphrey told KTLA TV. The second occupant, who was later identified as the driver, was pronounced dead at the scene. The pursuit began after a report of a shooting in the 500 block of Colden Avenue, according to LAPD Officer Jack Richter. Responding officers spotted a black van that matched the description of the vehicle being sought in the shooting and tried to pull it over, Richter said. When the van refused to stop, officers initiated a pursuit, Richter said.